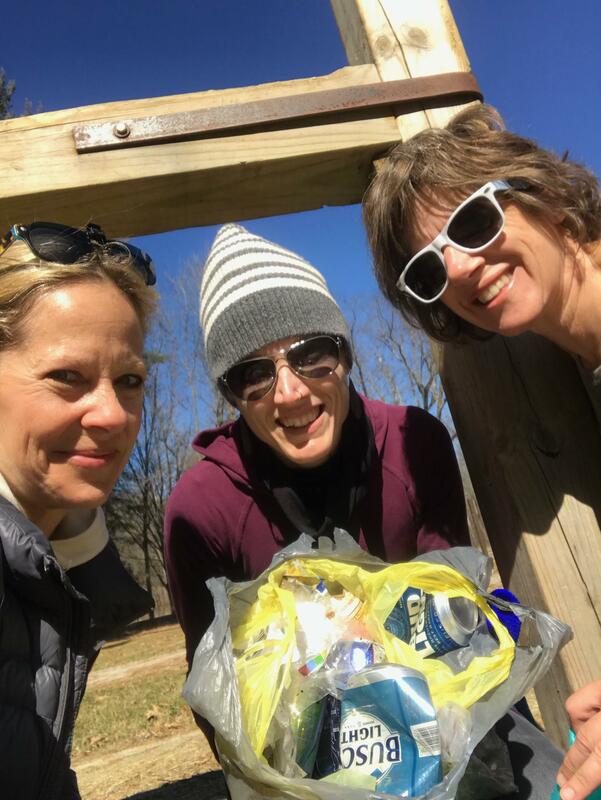 Commentator Beth Howard and her friends have started "plogging," which is picking up garbage while out hiking through Shimik State Forest. Beth Howard's commentary on "plogging"
In the winter months, when there are rarely horses on the trails, we hike in the section of the park designated for riding, which gives us more terrain to cover. After all, we are there to get a workout. Beth Howard (L), Christina Grelk, and Hope Krebill after wrapping up another "plogging" session in southeast Iowa. Our hikes take us deep into the forest to areas that you would expect to be pristine, but a glint of sun reflects off the ground catching our eye, as we hone in on an object that does not belong there, and then another, and another. Beer cans. Empty cast offs as if the woods—not to mention the ditches of our rural roads—were one big trash bin. Not to single out Busch Light, though that does seem to be the preference of local equestrians, we also find on the trails plastic bottles once filled with Gatorade or Mountain Dew, empty potato chip bags, candy bar wrappers, and some alcohol-spiked seltzer water called Truly, which judging by the number of cans seems to be a new favorite. During our first hike we picked up as many cans as we could carry, stuffing them in our pockets if they weren’t too dirty and carrying them in our gloved hands if they were. Thinking the litter might just be a one-off we didn’t bring bags with us on our second hike. But as the snow came and went, more and more cans appeared, like a trail of bread crumbs left behind in the woods, discarded as if aluminum were biodegradable and would magically disappear. 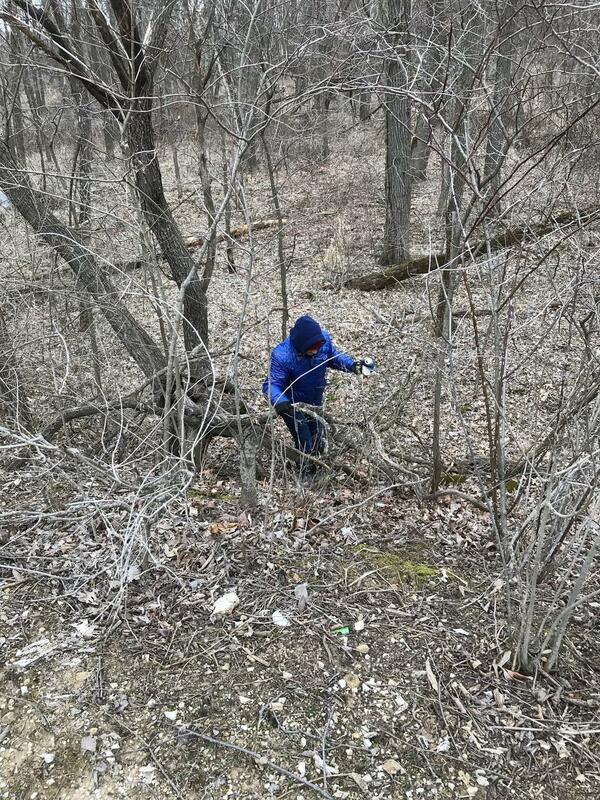 We were so compelled to pick up the litter we took turns fighting our way through the undergrowth, getting scratched and tangled up in thorny branches for the sake of Keeping America Beautiful. I sacrificed my fleece jacket to the cause, improvising a garbage bag by zipping it up and tying off the sleeves, filling it with so much trash it looked like a Macy’s parade balloon. By our third hike it sunk in: if hiking was going to be a regular thing, then so was picking up trash. We came armed with garbage bags and I started wearing my big backpack to carry out what we collected. After one of our hikes, we posed with our bounty for a selfie, which I later posted on Instagram. The comments came flooding in, along with the revelation that there is actually a name for what we were doing. It’s called “Plogging.” A combination of the Swedish word “plocka upp” (meaning “pick up”) and “jogging,” plogging is defined as “picking up litter while running.” And like fitness trends tend to do, this new sport is catching on across the world. Howard says reaching the trash can be quite treacherous at times. There are plogging organizations you can join, events you can sign up for, tips, hashtags, apps, grant programs, and a whole community of ploggers. Lifesum, a Swedish fitness app, claims that 30 minutes of plogging can burn 288 calories. That’s a half hour of trash collecting to work off one slice of apple pie, two Twix bars, or three cans of Busch Light. That’s right. Only 96 calories per can means we’re picking them up by the six-pack. My friends and I may be hiking, not jogging, but we are definitely burning calories and doing a lot of squatting. We are also doing a lot of grumbling. With each beer can added to the bag we vow we’re going to write to Anheuser-Busch and suggest they run an ad campaign instructing their customers to dispose of their cans properly. Their commercials might also advise that littering is a misdemeanor, and those guilty of the offense—should they be caught out there, say, in the far reaches of a state park—can be fined up to $625 per occurrence in Iowa, even more in other states. What I don’t understand is why risk a fine when you can get your five-cent deposit back on every can? How hard is it to carry your cans to a recycling or trash bin? (Shimek State Forest offers them in several convenient locations around the park.) But what’s most confusing is why anyone would sully the very land they come to enjoy for its purity. Plogging may be catching on as a positive environmental trend, and I hope more people join in, but how nice it would be not to have this extra incentive for exercise, how nice if more people would “give a hoot and not pollute,” because frankly, all those squats are starting to wear out my knees.